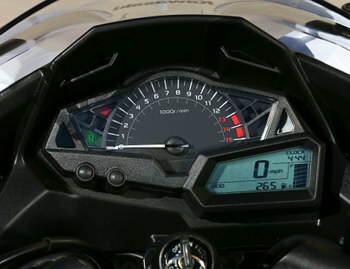 If you read Gabe’s report from the press introduction, you know that we are impressed with the 2013 Kawasaki Ninja 300. Its predecessor, the Kawasaki Ninja 250R, was a huge sales success for Kawasaki. As good as that bike was, its popularity was driven to a large extent by its low price. Redesigned in the 2008 model year, it carried an MSRP of $3,499. That price crept up, but the new Ninja 300 takes another big jump. The basic model is available for $4,799, while the ABS model is $5,499. We’ve come a long way from the 2007 Ninja 250, which was priced at a suggested $2,999. Of course, due to currency fluctuations and other factors, virtually all motorcycles have substantially increased in price since 2008. The single-cylinder Honda CBR250R, another fun motorcycle we also reviewed favorably, has gone up to $4,199 for the non-ABS model, and $4,699 with ABS. This is for a bike that makes substantially less horsepower and torque than the 300 twin offered by Kawasaki. Nevertheless, for close to $5,000 you expect a “real motorcycle”, with enough power to run away from automobiles in most circumstances. 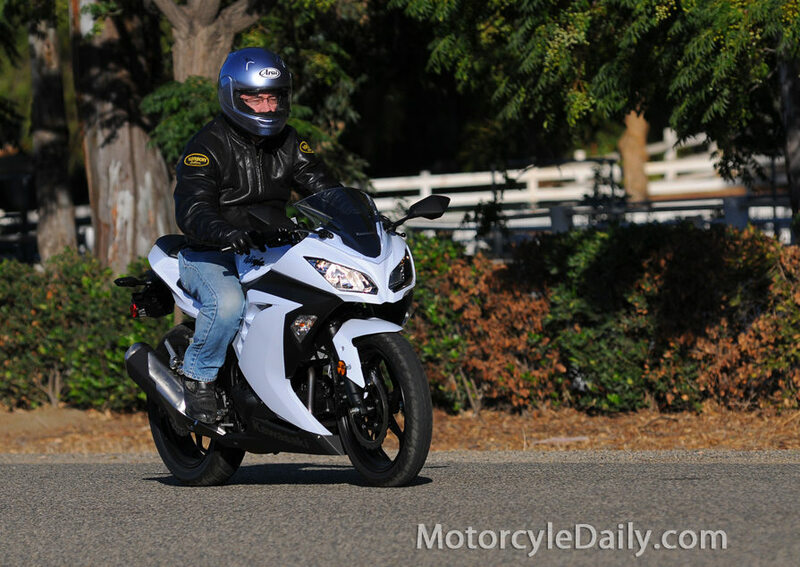 The good news is that the 2013 Kawasaki Ninja 300 offers that power, when its predecessor arguably did not. Obviously, this is not a rocket ship, and it has less power than most motorcycles sold here in the United States (where big horsepower rules). Nevertheless, after a longer-term evaluation, we could not help but be impressed with the complete package offered by the new Kawasaki Ninja 300. This bike looks completely different, and performs completely different from its predecessor. So different, in fact, you really don’t sense any direct lineage. It is still a parallel twin-engine, but with substantially more displacement (20%), fuel injection (as opposed to carburetion), and other engine tweaks, you can actually ride the Ninja 300 around town while staying under 6,000 rpm. You really could not do that on the old bike. Don’t get me wrong, this bike likes to rev, but it makes more torque at 4,000 rpm than the old 250 did at its peak (coming at roughly 9,500 rpm). Engine displacement may have increased by only 20%, but rear wheel torque is up roughly 30%, while rear wheel horsepower is up roughly 40%. As I said, this bike doesn’t really resemble the old 250. Gabe did not have too much difficulty exceeding a GPS-verified 100 mph at the press introduction. This bike is more than comfortable on the freeway, whereas the prior bike was wheezing heavily above 75 mph. The chassis feels just as different. A stiffer frame and much smarter suspension tuning has resulted in a bike that still changes direction easily, but has a much more solid, planted feel. At freeway speeds, it is as solid as a rock, even in crosswinds. The revised instrumentation is more thorough (as Gabe describes), and much more legible. Again, more like a bigger, more expensive motorcycle. Styling is subjective, to an extent, but there is no denying that the Ninja 300 has a more sophisticated, refined style than its predecessor. The complex shapes of the fairing just look more expensive. The dual headlights separate this bike from the Honda 250, and other bikes in its class (to the extent you can define other bikes as being in its class). As I said, this bike still likes to have its neck wrung, and it makes substantial horsepower at the upper reaches of the tachometer, between 8,000 and 12,000 rpm. If you are in a big hurry, you will spend much of your time above 9,000 rpm. The flat torque curve, however, does make the engine flexible enough to be ridden less frenetically without feeling slow. Despite the huge increase in engine performance, Kawasaki claims mileage has improved, as well. In our experience we saw a slight improvement, with 60 miles per gallon available if you are riding judiciously, i.e., without wringing the bike’s neck frequently. On the other hand, if you are racing around and trying to get the maximum from this relatively small engine, your gas mileage will fall into the low 50s, in our experience. As Gabe said, a fuel mileage competition at the press introduction resulted in some pretty outrageous numbers. A couple of journalists obtained more than 100 miles per gallon in a controlled loop, but they were employing some pretty extreme methods to get there. So the Ninja 300 has evolved from a motorcycle with adequate, if uninspired power, into a “real motorcycle” with enough power, when coupled with extremely nimble handling, to entertain entry-level riders, and even experienced riders looking for a smaller, more economical ride. The bike is safer, in our opinion, for freeway commuters, because it has plenty of acceleration available at freeway speeds. The single, 296 mm front disc brake (employing a two piston caliper) does the job more than adequately. It obviously lacks the power of a dual disc set up with radial-mounted calipers, but you would never find brakes like that in this price range (look at supersport 600s). Moreover, a single disc keeps the unsprung weight low, as well as the reducing the reciprocating mass of the front wheel, and undoubtedly contributes to the extremely nimble handling . . . an important, and special feeling when riding a smaller bike like this. If you can’t quite forget that the Ninja 250 was priced at $2,999 five years ago, you may have difficulty justifying the $4,799 MSRP for the Ninja 300 without ABS. If that is the case, we think you are ignoring at least two important points. First of all, pricing for all motorcycles has increased substantially here in the United States. For example, we live in a world where a 600 supersport costs nearly $12,000. 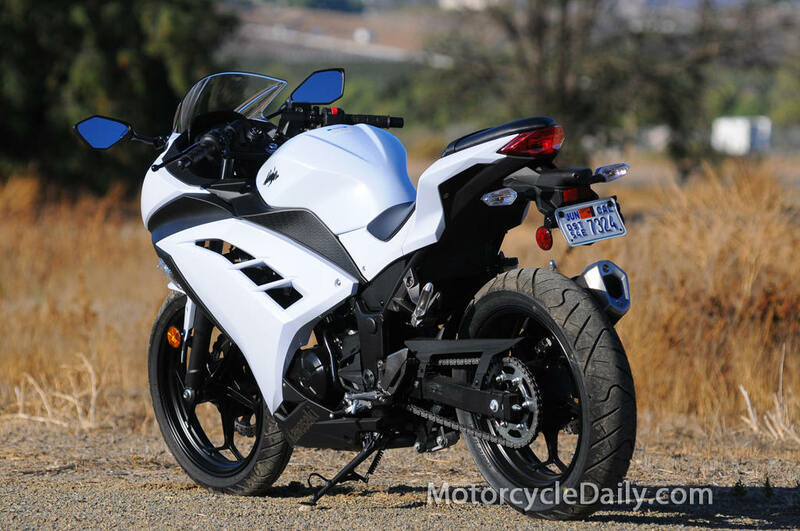 Single cylinder 250s (for example, the Honda CBR250R) are generally priced north of $4,000, as well. Moreover, the Ninja 300 is not really a successor to the Ninja 250R as much as it is an entirely new motorcycle slotted into a higher category. The performance and refinement is that much better. It is also fun to ride. From the sound of it, those fast, jaded moto-journalists racing around with Gabe at the press introduction had a blast. This bike has a small, intimate feel from the cockpit. For a sportbike, it has a very low seat height, is very slim between your legs, and maneuvers in a manner that larger displacement motorcycles typically cannot maneuver (even if they’re dry weight is close to the same). The bottom line is that the 2013 Kawasaki Ninja 300 is a fun and relatively inexpensive motorcycle that could be the perfect fit for a new rider, smaller riders, commuters, and even experienced riders who want an economical, fun, relatively light bike in their garage alongside their bigger machine. 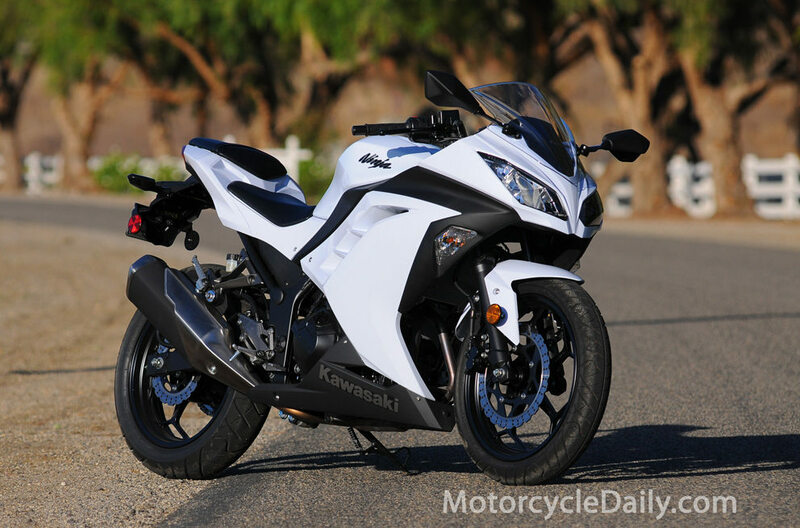 The 2013 Kawasaki Ninja 300 carries a U.S. MSRP of $4,799, or $5,499 with ABS brakes. The available colors are Pearl Stardust White, Lime Green/Ebony, and Ebony. For additional details and specifications visit Kawasaki’s website. I like it. But, I sat on one in the dealership and the seat is a racing seat and good only when you have more weight on your arms. I like a flat seat that I can slide back on like old racing bikes. That being said maybe a Corbin would work well. Maybe. Otherwise great motor. Rubber mounting for smoothness. Nice bodywork, though not white. There is a killer red and black one I saw on the web site. Seat to pegs pretty cramped for my 31 inch inseam. But I could work on the seat making it a little higher in the front and then have a nice commuter. I had the old 250 and rode it all over Hartford and the hills surrounding the Stafford Speedway. I also managed to take my plate off one day to do a test ride of another bike, forgot to put it back on, and then got pulled over by the State Police with no license either which was in other motorcycle pants. Ooops. He let me ride it to a local friend’s house. Fun bike these 250s in any case! If you have not tried one, you will like it. I commute about 50 miles a day, typically on a V-Strom, Ducati or Concours. But if this bike was more like 70-80 mpg I might justify it (to my wife)! It’s hard to justify the purchase at 60 mpg when I can get close to 50 on my Duc ST which has a wee bit more power and handles nicely. As I hit post I noticed you got rid of the Captcha!!! Halelujah, I couldn’t read that 1/2 the time. Thanks MD! The new 500 Honda will be a serious threat to this bike in the market place. ABS model only $500 over this 300. Absent the Honda, I might buy one??? I’m seeing the Honda CB500r @ $5,999, ABS optional, +$500. So you’re looking @ $6,499 for an ABS equipped bike with similar style/equipment (full fairing), $1,499 more than the ABS Ninja 300. The CB500F, with ABS, is only about $500 more than the Ninja 300 with ABS. The average customer will not see it as an apples to apples comparison (engine displacement not withstanding). The US market has struggled to sell naked, non-premuim motorcycles over the past 25 years. That’s because the market is screaming for middle-weight sport bikes with full fairings, not supersports. Why are the only options: the SV650 which hasn’t been redesigned in almost 10 years and the VFR800, which is expensive as hell and more of a sport-tourer. Come to think of it… why aren’t there more sub-litre sport-tourers too? Oh boy. It’s WRINGING the bike’s neck, not “ringing”. “The bike likes its neck WRUNG”, not “rung”. How on earth would it ever make sense to “ring” a neck??? What ever rings your bell. Fixed. Thanks for pointing that out. Amen. The redesign of the KLR didn’t go over terribly well with the die hards due to added weight and large fairing, and the KLX250 could use that 300cc engine too. If I was a kid, I would look no further than this Kawi. another excellent reviews,thanks Dirk.Been riding for 25 years got rid off my last ¨big bike¨ got a 250r,can’t stop saying good things about it,but now with the 300r mmmmm !!!! Merry xmas and a happy new year and a great riding season for all. Maybe they’re Kevlar stitched riding jeans? Yep, definitely not a good choice – black jeans would go much better with the jacket. Picky, picky, picky! It’s a free country and there’s no law that says you have to go ATGATT all the time! All The Gear All The Time? LOL, I’ll give you my PIN number at the ATM machine. Not everybody wants to look like a completed tool wearing chaps or the latest leather pants with armor. I wouldn’t be caught dead wearing those if I had places to go or people to meet. OMG! Something not totally safe published on the web! That is my riding attire 90% of the time. Been doing it for 35 years. Been down once, (wearing jeans) and scraped up my leg. The helmet likely saved my life. Are you saying you never ride without armored riding pants? That would put in you rare company indeed. Overall – great article. Just a couple of points. I’m glad you indicated that it was in “your opinion”. I’m not sure why some still believe the above to be true. If this were true, I think insurance premiums would be much higher for 250cc bikes on the market. Many do ride their bikes on expressways after all. Has there even been one documented case where someone has died as a result of not “accelerating hard enough” to get out of danger on an expressway? I’ve never read any empirical evidence to support the above notion. In my opinion, if you need to accelerate hard to get out of trouble – then you have likely already made several unwise riding decisions up to that point. If the above comment was followed by “Larger displacement bikes can be less safe, in our opinion, for city commuters, because they are less maneuverable and better maneuverability is likely to assist in accident avoidance”, it would bring a smile to my face. Yet I’ve never read any such line, and don’t suspect I ever will from a motorcycle publication. Motorcyclists feel safer with adequate power to move out of tight spots on the highway. Power on the highway is the same as maneuverability in the city. Both are advantages over cars that offset the lack of structural protection. They provide riders with more options in difficult situations. Agreed. GearDrivenCam may think that enough power to pull out of a bad situation is never occurs, but in my experience it does. We kept a VTR250 in the garage for 11 years while we had lots of experience on bigger bikes of every variety. I loved the 250 around town, and while my wife even toured on it for several years the lack of power in some situations was concerning. I always wished it had just a little bit more to be more comfortable passing or getting out of the way when getting pinched by a lane changer on a cell phone. Both the ABS and the significant increase in power make this a much more appealing bike for many. Great on Kawasaki for making the change. My point is that if you find yourself in a situation where you have to accelerate hard at highway speeds to avoid disaster, you have already made several mistakes up to that point. My second point is that (apart from Dave’s comment above) I’ve never read any motorcycle articles that mention the inherent safety of light weight, small displacement bikes in terms of maneuverability in the city. I guess the author would have to concede that larger bikes may be less safe than smaller bikes in certain situations. Perhaps it is this kind of bias that has in part, prompted manufacturers until more recently to be apprehensive about importing their smaller bikes into the U.S.
We are not alone on the road. We very often have other’s mistakes to contend with. I understand what GearDrivenCam is saying and I agree in that at what point are you safe and at what point are you not if you follow the logic that power gets you out of tight places? Is it just a feeling? To me it’s close to the same for those that say they “would never drive a car that small..” but have no issues with a car not that much bigger. Well, look behind you! That eighteen wheeler could take out just about anything you care to drive. Is this an issue of degrees? Obviously, choosing a 250 to tour on is not what most want to do. Thinking that a 300 is going to save the day may be a little short sighted as it’s just a notch more. My point: if I rode enough freeway, often enough, I’d tend to look at a larger bike anyway. To each their own. Exactly how much bigger and heavier and less maneuverable do you think 50cc’s adds to this bike? i’ll back this comment since technically he does qualify it. notice he uses the term “freeway”. ya gotta understand, this is a term unique to cali. anywere else in the lower 48, major roads are generally refered to as highways. having driven on outer loops from boston to LA and everywhere in between, it does seem apt for cali interconnects to be called something different. i’ve ridden a 250 on a busy “highway” and felt comfortable… but i think that had more to do with confidence in my own riding ability. you need to be armed with more than just confidence as the stop light meters you on to routes like 880 south of frisco or 5 south of LA in rush hour. lets just say it wouldn’t hurt if certain on-ramps had their stop lights upgraded to STEAM CATAPULTS. I think the key feature of a small bike like the 300 should be extremely good gas mileage, like 70 mpg in normal riding. Why pay $5,000 for a bike that can’t perform nearly as well as a 650 yet doesn’t do much better on fuel economy. My SV650S always gets close to the mid fifties mpg. Well Sherm, Suzuki got it right from the start with the SV650. In some ways, it started the of the mid-displacement bike comeback. Seems that after 1990 no one wanted smaller bikes until the SV came along with a fair price, good handling, solid performance and reasonable gas mileage. Good point and a good choice. There is a limit to fuel efficiency. It takes a given amount of energy to overcome a given amount of resistance. At a point it no longer matters what the engine’s displacement is, just how efficient the tune is. The SV650 would be a $9k bike to make new today. Thankfully there is a healthy used market full of them. I agree with the old adage “It’s more fun to ride a slow bike fast than it is to ride a fast bike slow”. At 6’2″. 220# I don’t look to purchase small displacement motorcycles, but could surely have a blast pushing one to its limit through the twisties. I think one thing that is crucial to a motorcycle of this type is inexpensive replacement body panels, simply because the probably of entry level riders having a tip over is probably much higher. If the panel prices are prohibitive, a damaged cycle with lower resale could sour a beginner. Fairing designs that are less susceptible to damage may be an alternative. I see the small displacement machines catching on here and think that’s a good thing. while cool, what you suggest comes at a cost. a cost that can’t be justified even on bikes with HIGHER price points/profit margins. what that means is fairing designs that are less susceptible to damage will forever be referred to as “Nakeds”. Now I really wish I was 16 again! One of my first bikes was a Yamaha RD350. One of the best times bike I’ve ever owned. Oh yah, the RD400 is what gave me a smokin’ good time in the early 80’s. DGs, clubmans, and those holes drilled in the airbox. Wish I wasn’t so naive to fuel/air ratios. She seized up tight doing the ton fifteen on a hot Texas Hwy 90. I loved her dearly, every red a black bit. The new UJMs are a fine tribute to an era when oil injection ruled the roads. Except now fuel injection does all the work! I think it is very refreshing to see all the new small and mid-displacement motorcycles. For senior riders who grew up on smaller bikes, these take us back to a time when motorcycles were inexpensive and lots of fun. There is something to be said for a bike you can ride at 9/10 instead of having to be afraid to unleash 150 hp or more. Good for Kawasaki, Honda, Husky, BMW and all the others who are expanding our choices. It could be another golden age of motorcycling. Merry Christmas to all, and to all a good bike! In a “performance” comparison, I see the Kawasaki winning – hands-down. The MSRPs reflect their engine size / dollar value, respectively. The Kawasaki has the performance cred – the Honda is a city commuter. Obviously Kawasaki markets most all their bikes with a “tude” and the coming Honda 500’s less so. That alone will attract some riders on both accounts. Commuter bike or not, the Honda 500 enjoy a substantial displacement advantage which will mean a good bump in torque. Being moderately tuned they will probably have a very wide rpm torque spread. How riders shop these two will rely on what Honda prices the 500’s at. i believe they’ve already long declared… $5,999 and $5,499. Every time I see this bike, I keep thinking that this will make the perfect track weapon–with some super sticky tires, this bike would be a heck of a good time. I’m curious how good the suspension is on track–I assume there isn’t a lot of adjustability, probably just pre-load–but if it can go stiff enough, then that would be just fine. I’m liking this small displacement resurgence here in the States! ooops, the title of “perfect track weapon” already belongs to suzuki’s venerable SV650. can’t throw a rock without hittin’ a clean, “chick-owned” example. Ha! you’re right–I used to own and track a SV–it was a great track bike. I dare say that this bike has the potential to be just as, or more fun! 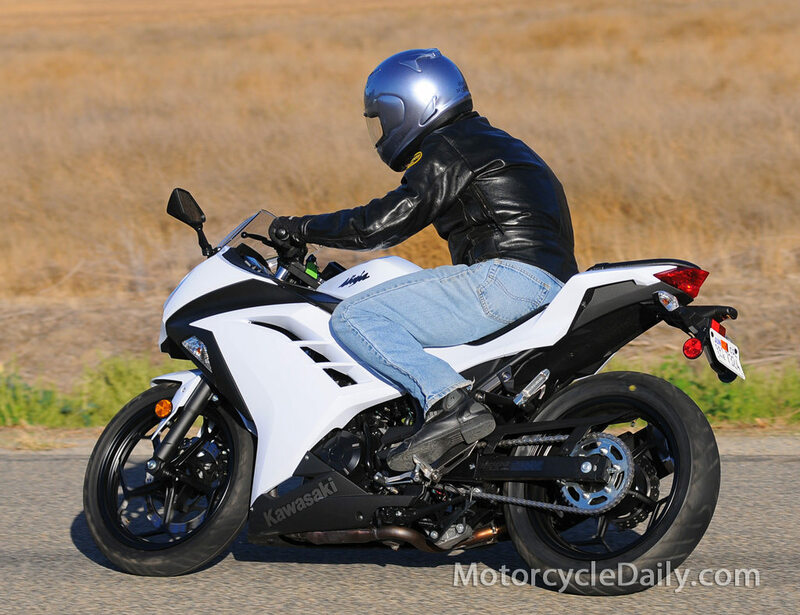 The Ninja is not priced VERY close to the new 500 series Hondas. Enough so a comparison should probably happen. This should get good! Must’ve missed something. What 500 does h\Honda make? My bad. Just had to look back, duuuuh. These bikes will be a hard sell with what’s in the used market. Couldn’t you say that with every new bike? It will be interesting to see how Honda prices its new 500’s which should offer another bump up in performance. We had been bemoaning the fact that there were too few choices in the lower cc ranks, now it may soon be confusing with many. Can’t win, just have to go riding I suppose? The struggle I see with the upcoming Honda is the inevitable comparison to the recently discontinued Kawasaki EX500 Ninja, Most of the CB500 info points to an engine tuned more for urban efficiency. A good thing, but you all know how motorcyclists hang their expectations on the max-hp number. The EX500 makes pretty good power and the used market is full of nice examples of the type for very affordable prices. We’re getting to the promised land. The missing piece might be auto-market loan interest rates.